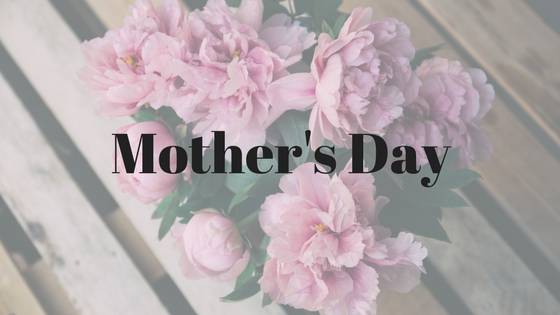 With Mother’s Day on the horizon, PCHA begins a series honoring Heart Moms. 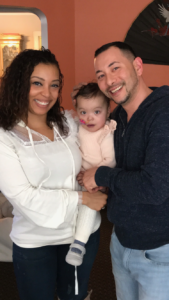 This week, Brett Nishibayashi shares a letter to his wife about their journey becoming CHD parents and his admiration for her love and strength. I remember when you first found out you were going to be a mother. The disbelief and overwhelming excitement all at a bubbling intensity was paralyzing. Unsure of what true emotion to feel, we embraced one another and leaned on our unconditional love and faith to guide us through. It’s ironic that these same pillars of our relationship are what we would need to rest on heavily sooner than later. Unfortunately we weren’t able to bask in the joys of pregnancy for long because we were given a different journey. Your path has never truly been the “normal” path and you have never been granted an opportunity to be a “normal” mother. You are far beyond the normal in all you do and motherhood is no exception. You are always perceptive and aware, constantly observing and analyzing, but even with those admirable qualities, nobody could predict your true calling. I vividly remember when you first found out you were going to be a heart mother. I remember the anxiety of the ultrasound. I remember the tremble in your hand. I remember the tears in your eyes. The car ride home, the vulnerability and the confusion of how this could be our story all resonate deeply in my soul. I mention these moments because they are the last days that I remember of the woman I met and married. From that point on you evolved into the new and improved version of that woman and I am still amazed at that transformation daily. 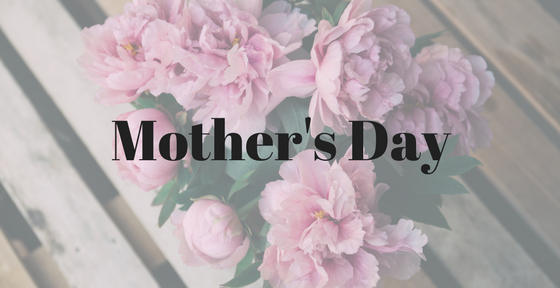 Since that moment, until long after you read this, you have been a fierce advocate and a perfect example of a nurturing and invested mother. Inspiring doesn’t begin to encapsulate the way you attacked this diagnosis and all of the pertinent information that comes along with it. 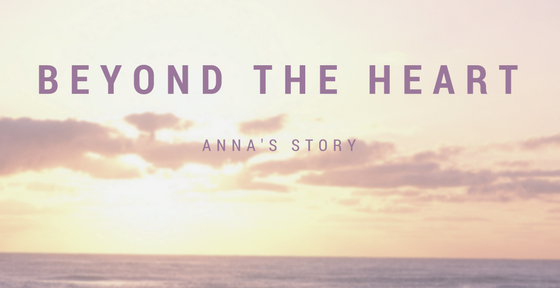 You immersed yourself in the CHD community learning as much as you could about Avery’s condition, its pitfalls and how we were going to mitigate its effects as best we could. None of this was easy as we stared in the face of the “what ifs” that lurked in our minds. The uncertainty of it all can leave you searching for more and more information, which once obtained, doesn’t necessarily subside the fear and anxiety of the imminent future. I mention all of this because I want you to know that I see you. I see you hurdling these obstacles as they are thrown at you with intent and grace. I see you losing sleep and how it chips away but still finding the energy to flash a refreshing smile and hearty laugh. I see you trying to be the best mother, wife, therapist, cardiologist, activist, pre-school teacher and I’m sure many more things that you can be. I see you trying to remain perfect in an imperfect world and it inspires me. I see how hard you push yourself but more importantly I understand why. I see you reaching out to help other heart families, recognizing that we are part of a larger community of heart parents. I see this and so much more when I look at you. You are the perfect mother for the perfect little girl and I am truly the lucky one. The other day I mentioned to you how I really thought you were an outstanding mother and you looked back at me with disbelief. Let me assure you that there should never be a single doubt in your mind on whether or not you are a great mother. Your love, compassion, attentiveness, patience and drive are unquestionably why our family enjoys so much happiness. I want you to know that you should always be confident of how well you are doing EVERYTHING. You deserve every blessing you receive and all those that are still to come. 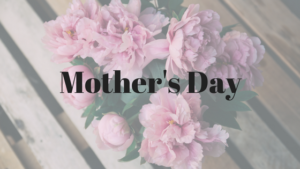 I wish you calm and peace on this your third heart mother’s day. May the serenity you deserve be all that you need it to be. I will always see you because I can’t take my eyes off of you. 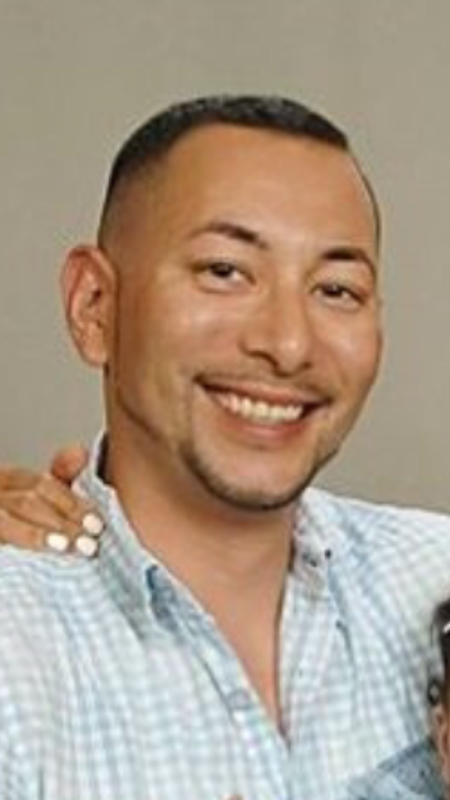 Brett Nshibayashi is a 39 year old heart father from Chicago, IL. He is a high school PE teacher and has been married to his wonderful wife for 3 years. 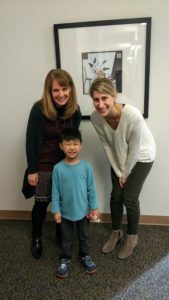 Brett considers himself honored to be a part of this community of heart parents. 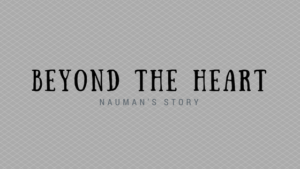 Adult patient and medical student, Nauman Shahid, shares what he learned about the way different body systems interact with one another through Medical School and personal experience. 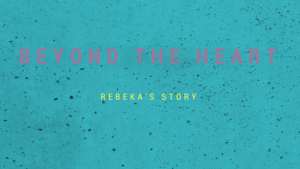 Here, he shares the complications that developed with his lungs as a result of his Congenital Heart Disease. 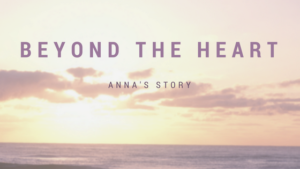 When we think “Congenital Heart Defect” we often think about the “heart” and only the heart, but as someone who attends an Osteopathic Medical School, Ive come to realize that this is only the tip of the iceberg in the realm of CHDs. One of the tenants of the Osteopathic medicine philosophy happens to be in how the body is a unit as described by the founding father Dr. Andrew Still. Within this unit lie different organ systems that work in sync to create a balance of homeostasis. Its when we have a disturbance in this “homeostasis” is when we have a diseased state that may often require medical intervention in addition to the body’s own ability to self regulate. 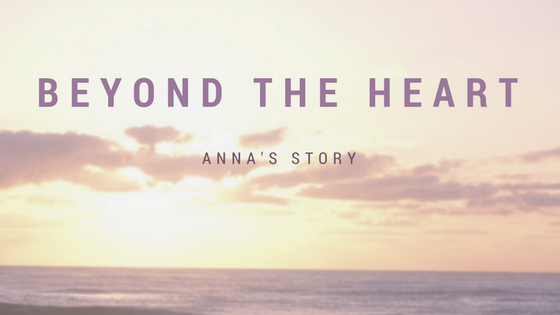 In this short piece, I will attempt to introduce one piece of this unit at the organ level to facilitate the understanding in how a Congenital Heart Defect is much more than just the “heart” with a focus on respiratory/pulmonary ailments. Nauman with Representative Gus Bilirakis at the Legislative Conference in Washington D.C.
Having Tetralogy of Fallot diagnosed at a very young age, my parents were often told of the potential respiratory issues that may arise during the course of my life. As such, many Tetralogy of Fallot patients often require a pulmonary valve replacement by virtue of the initial repair surgery in which the pulmonary valve is disrupted. Coupled this with having a stenotic left pulmonary artery, this substantially increased my right sided heart pressures and decreased the blood flow to the lungs in general due to having pulmonary artery hypertension. Overtime this can cause issues in the long run as it did for me. As a result, during times of strenuous exercise or any activity in which it increased the heart rate, I would find a great amount of shortness of breathe coupled with lower extremity edema. This can be thought to have similar implications as an infant having a crying “TET” spell. This often occurred as a result of the lungs not receiving adequate amounts of blood. This resulted in a back up of blood in reverse all the way down to the lower extremities. A way to think about this is, imagine having a backup of water in your sink due to having a faulty water sink disposer. The water will continually collect unless the core of the issue is resolved. In which case, for me, was a faulty pulmonary valve coupled with a stenotic left pulmonary artery which caused respiratory issues. You might be asking, “how does all of this relate to a pulmonary issue”? To answer this, we need to first define pulmonary artery hypertension, in which it is a condition where the blood pressures are increased within the arteries of the lungs. Pulmonary Hypertension is a broad spectrum term which has 5 distinct groups of etiologies as defined by the World Health Organization. In my case, having a stenosis of the left pulmonary artery increased the pressure and caused a back up of blood which in turn causes the heart to work harder. It should be noted that normal pressures for the pulmonary artery are usually below 20 mmHg. However if this pressure rises to above 25 mmHg during rest, it is by definition pulmonary artery hypertension. It is very sensitive to minute changes in pressure and hence why the right side of the heart that leads into the lungs is called the “low pressure system”. For me as the patient, it caused a number of different issues. I often had increased exercise fatigue, shortness of breath when playing sports, and palpitations. 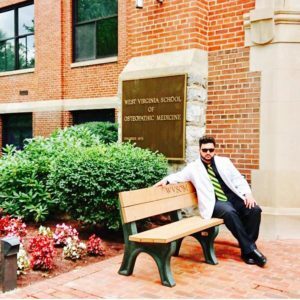 Being in medical school, it did not help me where I would sit for long durations of time. During this time, I got a bit ill and developed pneumonia. I had repeated trips to the emergency room near my medical school. As a result, many of the ER doctors I saw were obviously not trained enough in the realm of dealing with congenital heart defects and were also confused when administering certain acute therapies including nebulizers and other respiratory treatments with a probable focus on it being a pneumonia infection. Additionally asthma was also likely present as well with the larger issue ofcourse was dealing with these EKG changes that got many doctors confused. When I initially started to get palpitations, and shortness of breath, I used to think the acute altitude changes were a contributing factor since my medical school is a bit higher in elevation in rural West Virginia. While that may also have contributed to my symptoms, it ofcourse was not the entire story. During this time, I remember my mother telling me all the time, “Nauman, your heart is telling you something, you should listen to it”. As they say, mothers are never wrong, and rightly so. The exercise fatigue, shortness of breath ended up being much more than just asthma or pneumonia alone. Finally, I got to see a Cardiologist after narrowing down that it was likely my heart that was acting up which was now affecting my lungs as well. It was only with my Cardiologist in New Jersey did I learn about the gravity of the situation and the likely intervention required. reconstructed my RVOT, and repaired a hole in the septal leaflet of my tricuspid valve which came about as a result of my severe pulmonary valve regurgitation. The take home message? Depending on the complexities of your congenital heart defect, it is imperative to understand that no two CHD’s will be identical with a varying degree of severity. With this, it is important to note that as in my case, it is not just about the heart in a localized fashion. This was just one example in how something as simple as 3 pieces of tissue coming together to make a valve that open and close due to pressure differentials can cause such a dramatic effect. This being, lower extremity edema, increased right heart sided/pulmonary pressures, shortness of breath and ultimately damaging the heart to a point of no return effecting the systolic (pumping function) of the heart. Furthermore, the artery connecting the right ventricle and the pulmonary trunk may get stenotic to where one may have higher pulmonary pressures and thus have pulmonary hypertension. For this reason, it is imperative to understand the human body as a unit of different organ systems working in concert to achieve the process we so often taking for granted known as life. By addressing the core etiology that disrupts our homeostasis you can address each component collectively and individually which in my case was the dysfunction between the circulatory (heart) and respiratory systems (lungs). I never really knew how much these issues were effecting me until I got treatment. Although my recovery from open heart surgery was anything but normal due to having pleuritis and other issues, I have come out well. In fact aside from my ability to return back to my fitness regimen, I noticed a great increase in my intellectual capacity to where I have been ranked in the top tier of my medical school class as I am no longer fatigued or tired during the rigors of medical school. 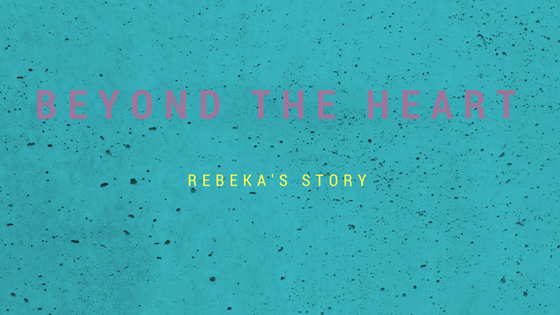 While I know, many of my fellow heart warriors are not looking forward to a possible surgical intervention, I can safely say everything indeed happens for a reason. 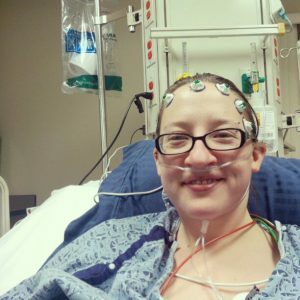 If it wasn’t for my pneumonia, they may not have ever picked up on my EKG changes. As my mother said it best, “Listen to your heart, its telling you something”, and finally my heart is content with this outcome because while I may not be where I want to be, I am simply glad I am not where I used to be. 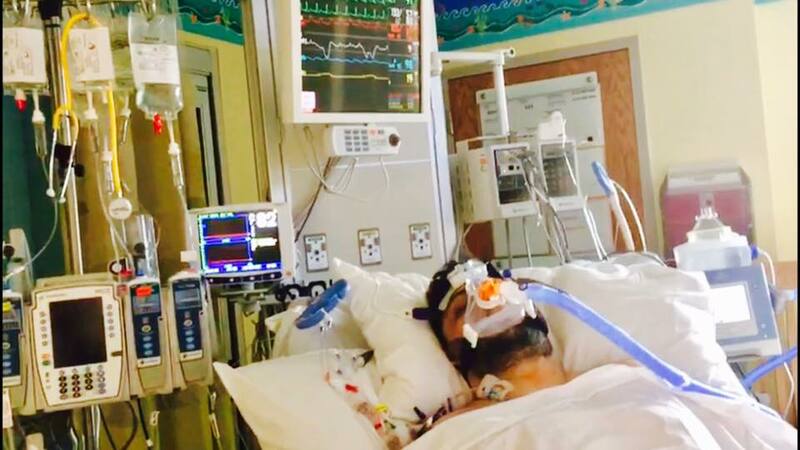 Nauman Shahid is a 31 year old Tetralogy of Fallot Patient who is well known in the congenital heart community as a regular contributor on various social media platforms. He is involved in various congenital heart awareness initiatives including being a Hearts Unite the Globe (HUG Network) Volunteer as a Guest Host for their CHD radio show (Heart to Heart with Anna), Chief Operations Officer/Board Member for the Tetralogy of Fallot Foundation, recipient of the PCHA Scholarship to attend the 2018 Congenital Heart Legislative Conference in Washington DC where he met lawmakers to advocate for H.R. 1222 (Congenital Heart Futures Reauthorization Act of 2017), and selected for the 2018 PCHA Calendar for the month of November. 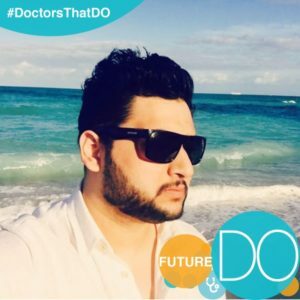 However one of his strongest contributions comes as a result of him being a dedicated medical student where he lead an awareness campaign on campus during Congenital Heart Awareness week on Feb 9, 2018 where he along with a few dedicated classmates distributed purple ribbons along with relevant literature in an effort to inform the next generation of breeding physicians about CHDs. 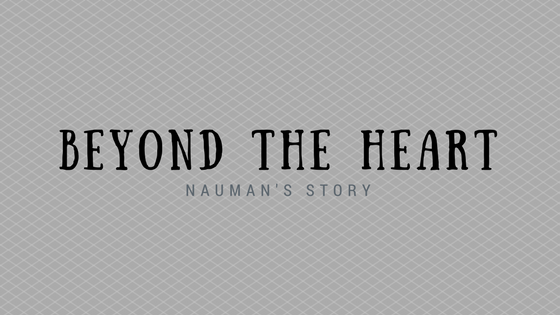 When Nauman is not studying, he is often found to either be boxing in the gym, BBQ/cooking some of his favorite foods, touching base with fellow heart warriors and their families to lift their spirits or resting up listening to his favorite soft rock tracks. 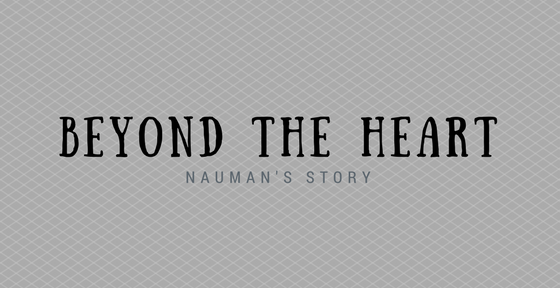 Nauman will be attending a 2 week clinical internship at Cincinnati Children’s Hospital’s Heart Institute to observe the various complexities of cardiac ailments in the clinic and surgery. He has earned a Bachelors of Science in Biology and a Masters of Public Health (Honors) with a focus on Health Policy. He attributes much of his success to his family and aspires to help heart warriors with congenital heart defects as a future physician. Becoming part of the CHD community can be a shocking and overwhelming experience. 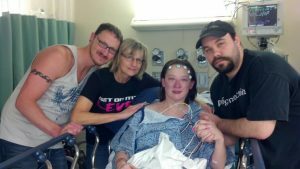 Our series on New Diagnosis offers new family a view into the fist steps of others who have come before them, in hopes they may ease the the journey if only just a bit. 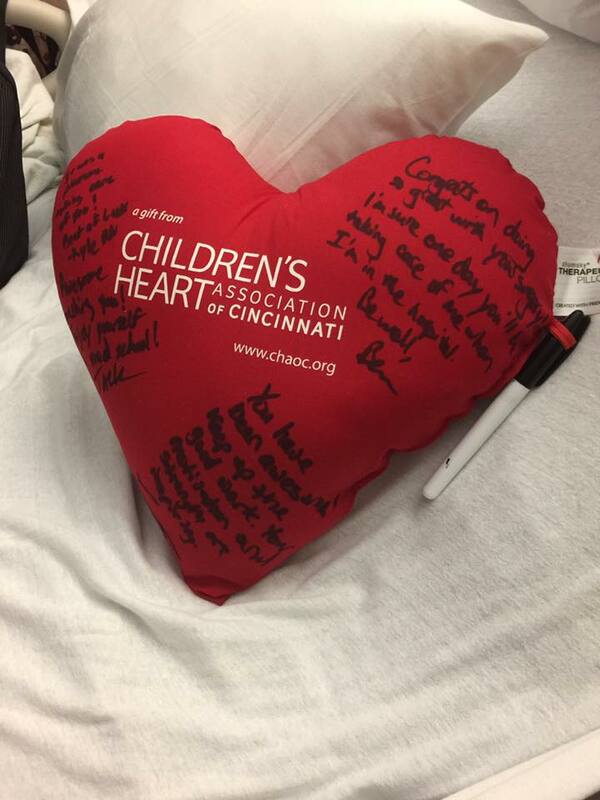 After the diagnosis of his son, Dr. Stephen Caldwell, used music to chart his family’s experience with CHD. Watch below, and find the lyrics to “Pre-Existing Condition” and Dr. Caldwell’s thoughts on his work. Like 40,000 other babies each year, our son was born with a Congenital Heart Defect. His diagnosis left us speechless: Tetralogy of Fallot with conoseptal hypoplasia, right-sided aortic arch, left-ventricular systolic dysfuction, and left branch pulmonary stenosis. The next several months unfolded like a dream that included multiple medivac helicopter rides, more than 100 days spent in the CVICU, two open heart surgeries (a palliative procedure to install a Central Shunt at 6 weeks, and complete repair at 9 months), millions in medical bills, 20,000 miles driven between where we lived in Fayetteville, AR, and Arkansas Children’s Hospital in Little Rock, and stress on an indescribable scale. Pre-Existing Condition chronicles that journey, from the onslaught of medical terms thrown at parents when they receive the diagnosis, through the birth of a medically fragile child not knowing if they will live, through helicopter rides, 911 calls, ambulances and ERs, the stress of extended CVICU stays with their uncomfortable chairs and constantly beeping monitors, and the cloud of emotion that runs around these events. At the center of the chaos, however, is a child. A child that needs love, attention, and support. A child that shows their parents what courage is. Children born with CHDs are remarkably fierce in their determination to live, and are immensely proud of the scars they bear. 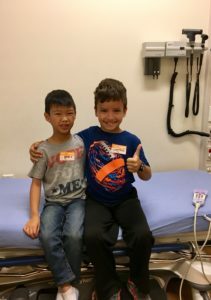 Though labeled for life by medical and insurance companies as having a “Pre-Existing Condition” these children fight against the tide of that label, to prove to everyone that every life has equal merit. Mister and Missus, I’m going to get the Doctor. There’s a risk of mortality. 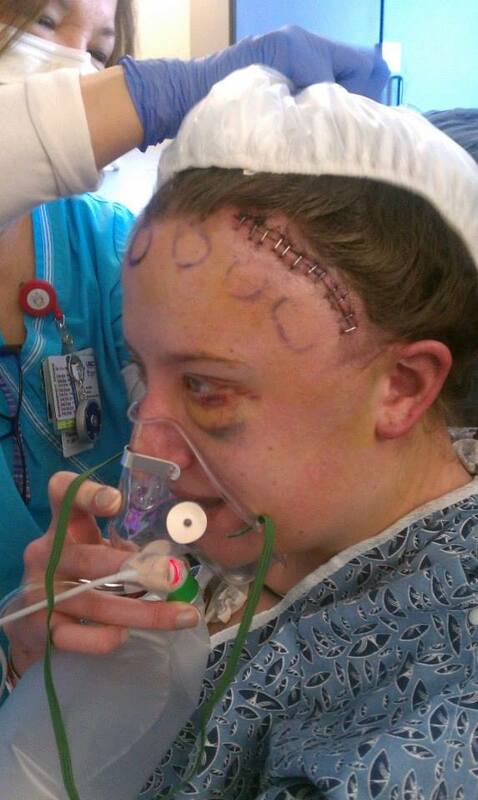 The ICU is $8,000 per day. But the fall never comes. Giving the vibrations in the air memory. The restraints dig and cut. Frantic haste masked by stillness. The grass is so green! The sky so blue! Extinguishing like the moonlight at dawn. Amongst the chaos, I am along with him. Brought by a nurse, who said I looked thirsty. I ask the moon to drink with me. Then I sigh, for the moon cannot drink. “Hush now, little baby boy. I’m glad to make the moon my friend. But when it becomes too much, we part. For now, I need steady emotion. What will they think of you and me, when they see our scars of such degree? What will they wonder, with quiet nod, what did they do to be punished by God? Did they not pray? Did they not sacrifice? Will they think you a warrior with courage so brave? Will they think you a hero, of the lives that you’ve saved? Will they ask of your battles, of your stories and lore? 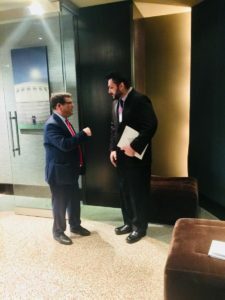 Of combat and fighting and bullets and war? That we don’t need their sympathy? Scars are forever, there to see, what has happened to you has happened to me. Wounds of the flesh one can hide. Wounds of the soul are kept all inside. Our scars are the same, yours and mine. Your scars of the body, my scars of the mind. There is still much unknown about adult Congenital Heart Disease Patients and the long term effects of their treatment in childhood. This week, Marissa, a single ventricle patient about to complete her nursing degree, shares her story of an unexpected complication, which almost cost her future in nursing. I call myself a “heart patient”, but why? Sure, I was born with six complex congenital heart defects, but my heart disease effects more than just one body system. As a 21-year- old Single Ventricle Fontan, I’ve always had my routine EKGs, echocardiograms, stress tests, halter monitors- you name it. Because I am a fontan, I’ve been made aware of the high likelihood of developing liver cirrhosis, so I have liver ultrasounds each summer. There can be issues with pregnancy, exercise tolerance, mental health disorders, and an overall a deterioration of the Fontan circulation. I’ve always been very realistic and knowledgeable with my own health condition, which is why I was so surprised when I heard my doctor say the words “you have T-cell Lymphopenia related to your Fontan circulation”. 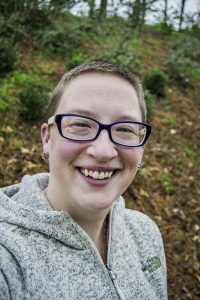 In November of 2016, I underwent a diagnostic endoscopy that yielded abnormal findings. 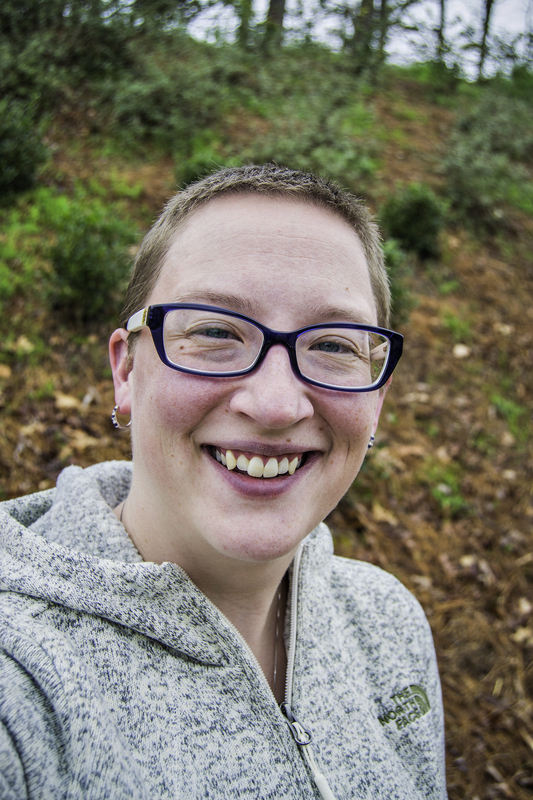 A week later, I found out I had an infection lining my esophagus. I presented with no symptoms and had been completely unaware of the infection. The treatment was simple, a two-week course of oral antibiotics, but my doctor felt I needed to undergo further immunology testing, considering this was an opportunistic infection. After three separate lab studies showing low immune cell counts, I was referred to an Immunologist in Philadelphia. Since then, I’ve seen three separate immunology specialists. 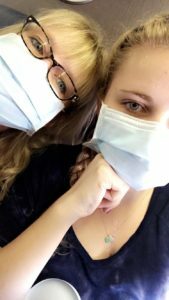 Marissa and her Mom wearing surgical masks while flying, to protect themselves. T-Cell Lymphopenia is a secondary immunodeficiency that results in decreased levels of T cells (infection fighting cells) within the blood. The high pressures within my circulation do not allow my lymphatic system to release the proper amount of T-cells needed within a healthy individual. For me, my case is mild and was caught early, however; the newfound diagnosis almost ended my career as a nurse before it even began. 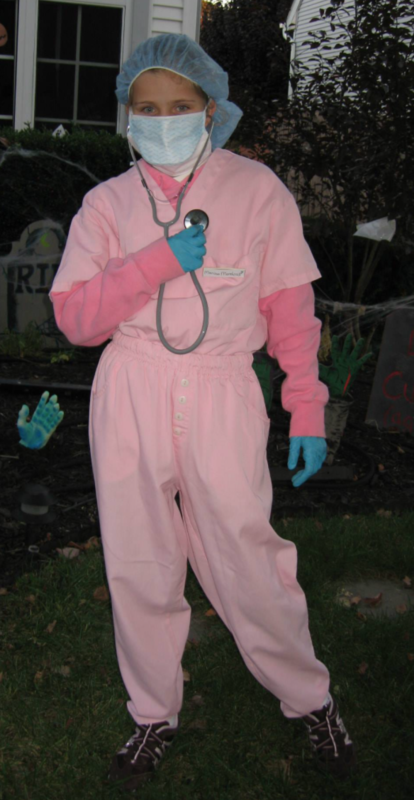 Marissa dressed as a nurse for Halloween when she was 9 years old. When starting my last year of nursing school, I was told I couldn’t complete the program with the accommodations my doctor required. 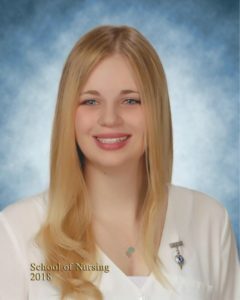 I was devastated to find that I may not be able to graduate with my nursing degree, and I may not be able to fulfill my passion to work as a nurse. I had spent three years studying and preparing to succeed in my future career, and it all came to a halt on a warm August day. I’ve always tried to treat myself as normal as possible; I’ve never wanted my congenital heart defects to define me as an individual. I knew this career would be tough, especially for someone with a single ventricle. Nursing school is the most challenging thing I’ve ever done, but hearing that I wouldn’t be able to graduate because of my heart was the worst part. No matter how hard I studied, how well I performed in clinical, and how well I prepared for my future, that didn’t matter anymore. With this crushing reality, I requested a third opinion from a pediatric specialist, hoping this physician would have more experience considering Congenital Heart Defects are from birth. Marissa in her scrubs now, at the age of 20 years old. Thankfully, after visiting a third immunologist, I now have no restrictions related to my T-Cell Lymphopenia. I will require follow-up care to monitor my T-cell and vaccination levels, however, I have NO restrictions in the clinical setting. I’m allowed to finish my degree to fulfill my dreams and work as a nurse. I’m incredibly grateful to have been able to see a specialist who was familiar with my diagnosis. Apparently, T-Cell Lymphopenia is present in a small percentage of Fontans by the time they reach their early 20’s. CHD does go beyond the heart, and affects the body in various ways. It’s important that we as patients receive lifelong care, but this can be challenging when complications arise outside of the heart. Although it took over a year, I’m thankful to have received the proper diagnosis and plan of care. I want to inspire others to be an advocate for themselves and to not give up on their dreams. Life can get difficult sometimes, but through determination we can reach our goals,even when taking an unconventional path. Marissa Mendoza lives in New Jersey and was born with six complex congenital heart defects. She was diagnosed with a Ventricular Septal Defect, Congenitally Corrected Transposition of the Great Arteries with Ventricular Inversion, Pulmonary Atresia, Bilateral Superior Vena Cavas, and Dextracardia. 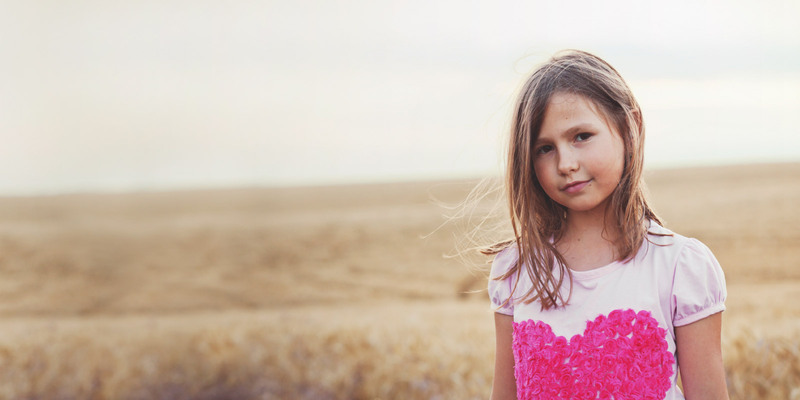 She underwent three open heart surgeries before the age of two, now classifying her as a Single Ventricle Fontan. 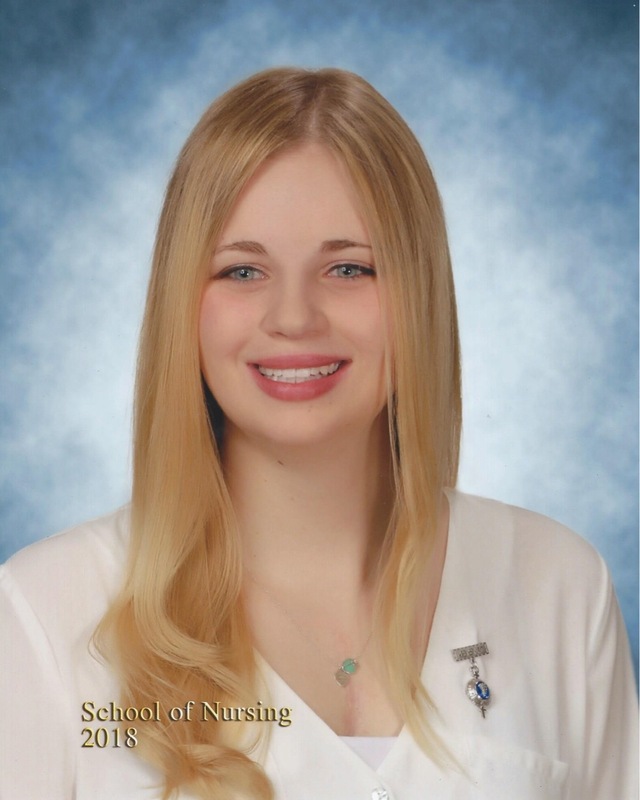 She is a senior year nursing student graduating in May, 2018 and has a passion for working in pediatric cardiology. 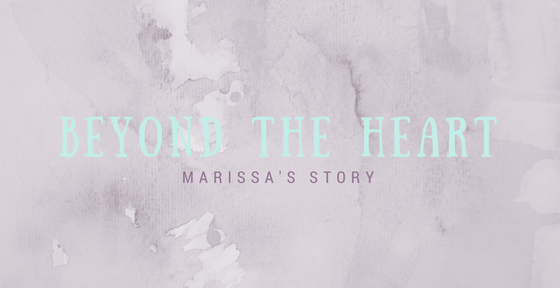 Marissa has a lifelong goal to increase awareness of Congenital Heart Defects and serve as an advocate for not only herself, but for the millions of others facing this chronic condition. 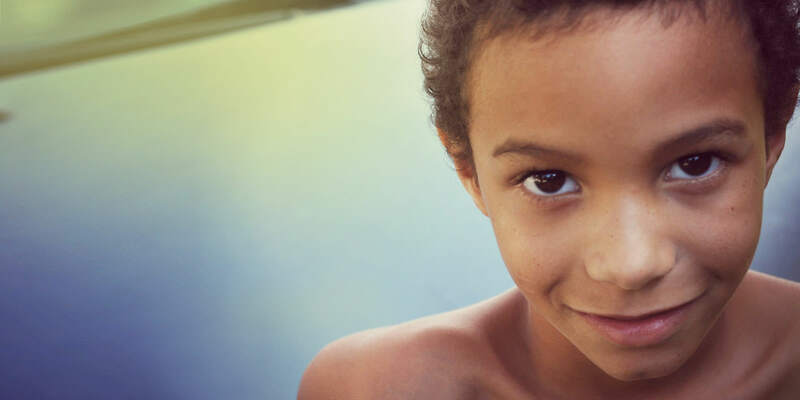 CHD can affect so much more than the heart, yet physicians unfamiliar with Congenital Heart Disease may have trouble seeing the big picture. 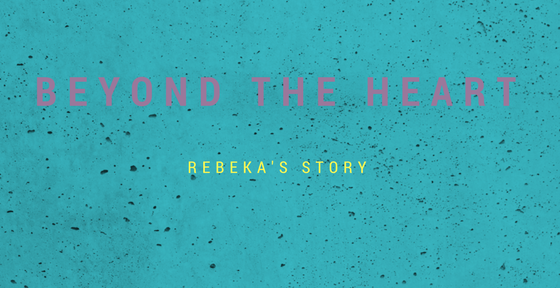 In this week’s post Rebeka Acosta, PCHA Steering Committee member and Mom to two heart warriors, shares the struggle of coordinating care outside of cardiology. practitioners, and advocate for my kids’ entire bodies. If that sounds like a full-time job, you are correct! My youngest son has single ventricle anatomy and experiences challenges in the neurodevelopmental and neuropsychology spheres. Difficulties with word recall, attention and focus, and auditory processing have left many clinicians with puzzled looks on their faces. Some prescribed therapies with scientifically unproven results, while refusing the connection to CHD. Others were willing to learn and adjust their techniques to best work with him. Looking back, gross motor delays around 3-5 years old were the least of his challenges! 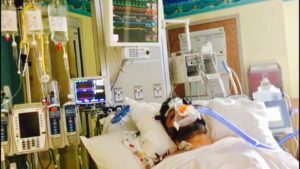 My oldest son with minor anatomical cardiac differences has multiple airway and pulmonary disorders, which include treatment from multiple specialists. Who knew the airway was as complex as the heart? 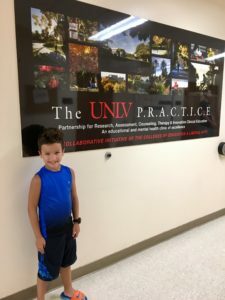 His airway diagnoses are part of the outdated school of thought that “kids will eventually grow out of it”, so it has been a several years battle to find clinicians that specialize in and treat them. We are all excited for his evaluation next month and the possibility of a surgical repair! 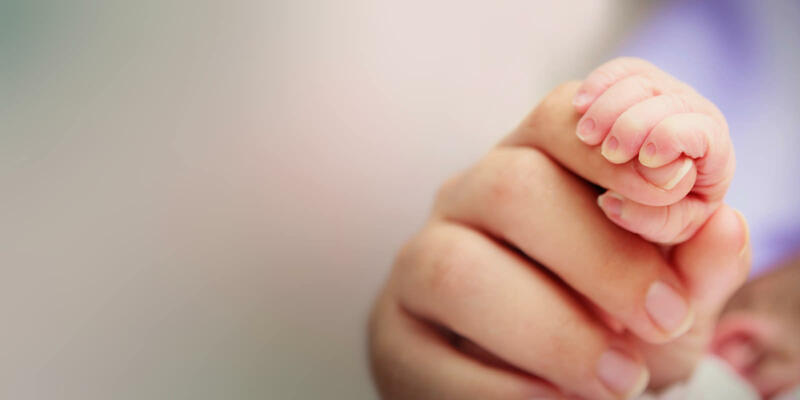 expert and your child’s primary care provider. transparency summits. 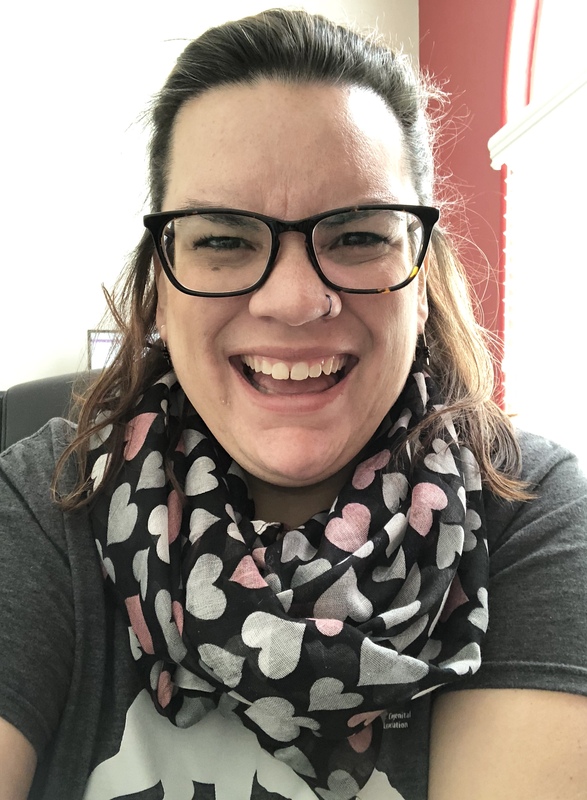 Rebeka welcomes connections at racosta@conqueringchd.org. You can also follow Gavin & Taosies’ CHD adventures on Instagram.